Although the tablets have already experienced the peak of their popularity, it’s too early to write them off completely. There are some areas in which they are simply irreplaceable. Getting a laptop to school or university is hard. You can try to do with a smartphone, but this is not always comfortable. A tablet is quite another thing: it weighs little, fits in any bag, and the charge holds all day. Yes, and read on its screen is much more convenient than on the screen of a smartphone. The tablet comes in a neat box with orange sides and a white lid. It is made of cardboard that is so thick that it can easily withstand any journey without additional packaging. The package includes only a USB Type-C cable and charger. In our case, it was with a Chinese fork. However, fresh batches, as far as we know, are already being completed with a normal European charger. In appearance, the Teclast M89 resembles Apple tablets or Xiaomi. The same thin metal body, a high-quality screen with a ratio of 4: 3 and a similar layout of controls. This is not surprising: this design has already become a classic. The main part of the front side of the Teclast M89 is occupied by the screen. It is framed with black plastic frames, the thickness of which is 18 mm at the top and at the bottom and 7 mm at the sides. On the surface of the screen stuck a protective film. There are no buttons in front, only the top of the front camera is located. The screen can be attributed to the main advantages of this gadget. It is not inferior to the same Mi Pad 3 and significantly exceeds Mi Pad 4, in which the resolution was reduced. The Teclast M89 uses a high-quality matrix with a resolution of 2,048 × 1,536 pixels and a 4: 3 aspect ratio. It is made using OGS technology, which made it possible to reduce the thickness of the display and achieve an excellent picture. Reading books, surfing the Web, working with texts on such a device is a pleasure. The letters look as if they are written on paper, the pixels are not visible even from close range. The image is rich in colors, high contrast, and the right white balance. The tablet supports MiraVision technology, which allows you to adjust the color and contrast to your taste. For lovers of reading, there is a special mode that makes the image on the screen monochrome. Brightness levels vary widely, which makes it possible to use the tablet in almost any light. 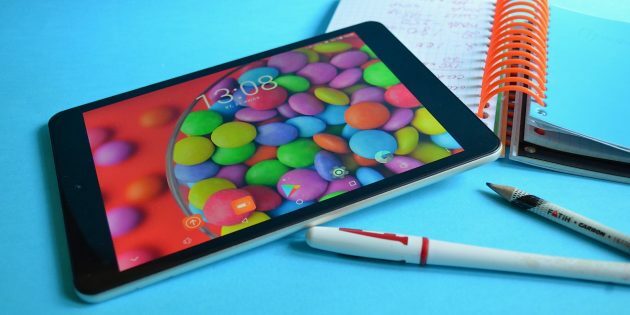 For surfing the web, social networking, watching movies, reading books and any other tasks that do not require record computing power, the Teclast M89 fits perfectly. Programs run quickly, the operating system interface does not lag, there is enough memory to run several programs at once. The Teclast M89 uses a non-removable battery with a capacity of 4,840 mAh like others best smartphones 2019. This is enough for continuous operation of the device (web surfing, watching videos, playing music, working with texts) for about 5 hours. In other words, one intensive working day or school day is enough. If you do not strain too much and give the tablet time to rest, you can stretch the battery charge for several days. Special mention deserves a good optimization software. At rest, the device consumes almost no energy, so it can safely lie somewhere on the shelf for a week without a significant drop in charge level. Every buyer wants to find a gadget that has all the characteristics of the flagships, but it costs a penny. However, this is not possible. You have to find a balance between your desires and real options. Teclast M89 is a good example of such a compromise. This is a nice inexpensive device that copes with all the usual tasks, has a gorgeous screen and sounds good in headphones. The tablet has a strong metal case, fits in any bag and can work without interruption all day. Excellent purchase for the new school year for those people who know how to count money. PREVIOUS POST Previous post: What is TrueCaller? How True Caller Works?